It guarantees the ‘right to work’ and ensures livelihood security in rural areas. It ensures women empowerment by providing equal wages and reservation for women. It also aims at reducing rural- urban migration and creation and maintenance of rural assets and environmental protection. A recent study has found that data manipulation in the MGNREGA is leading to gross violations in its implementation. In recent years, there have been at least 74 reported starvation deaths, with 60 cases having occurred in the last two years across parts of India like Jharkand. A hastily produced and insensitive language report concludes that none of these deaths was due to starvation or connected to MGNREGA. The governments in the State and Centre are demonstrating alarming indifference in this matter and are covering up realities by deliberately manipulating and obfuscating data. MGNREGA is a demand-driven programme, i.e., work must be provided within 15 days of demanding work failing which the Centre must pay an unemployment allowance (UA). A UA report is generated but rarely implemented due to funds crunch. Field functionaries don’t even enter the work demanded by labourers in the MGNREGA Management Information System (MIS), leading to information suppression at the source. Lack of offline alternatives to capture work demand from labourers means that data on the MIS are being treated as the only truth. Although work demand data (in person days) and employment-generated data are available at a panchayat level, aggregate data at the national level are only presented for employment generated. Thus, under-registered national demand is captured but intentionally not reported. By doing this, the Central government is trying to hide its violation of the extent of under-provision of work. The delay in the payment of wages which is captured in the system is intentionally suppressed to avoid paying delay compensation. Based on analysis of work demand and employment generated for over 5,700 panchayats across 20 States (for 2017-18 and the first three quarters of 2018-19), the employment generated was about 33% lower than the registered work demand, and last year, about 30% lower. About 16 States still show a negative balance which shows the continued lack of funds. The Centre’s oft-repeated claims of the “highest ever allocation” are dubious and meaningless because if the allocation does not honour work demand and it is a violation of the Act. Contrary to the Central government’s claims of there being more than 90% payments on time, the study found of more than 9 million transactions that only 21% payments were made on time in 2016-17.The trend continued in 2017-18. Further, the Central government alone was causing an average delay of over 50 days in the disbursement of wages to labourers, as against the mandated 15-days else a delay compensation. This not only reflects contempt of court by the Central government but is also an insensitive assault on people and a deliberate hiding of the truth; leading to loss of countless lives. The Supreme Court in the Swaraj Abhiyan vs. Union of India case stated that said that the delay caused in stage-2 was not taken into account for the purpose of payment of compensation. Before the ruling, only stage-1 delays were proposed to be compensated. The court urges the Centre that they should also share the blame if they cause the delay in stage-2, failing which the prescribed compensation would be paid. The Centre has now suggested a new format to compensate payments. Incorporation of ICT infrastructure at grassroots level, so that the data is available in public leading to better transparency and accountability. Social audits, mandated by law under MGNREGA, should be strengthened to reduce the data suppression and under-representation of job demand. The proper implementation of MGNREGA, among other measures, can go a long way in improving the life and the livelihoods of many distresses rural citizens. The triple, correlated crisis — a lack of sufficient funds, rampant payment delays, and abysmal wage rates should be fought out by better implementation of the scheme. ASEAN is a regional grouping of 10 South East Asian nations set up under Bangkok declaration in 1967. India’s relationship with ASEAN is a key pillar of our foreign policy and the foundation of our Act East Policy. India and ASEAN observed 25 years of their Dialogue Partnership, 15 years of Summit Level interaction and 5 years of Strategic Partnership in 2018. India’s policy has not been some sudden bright inspiration of an individual but a gradual growth evolving from even before independence. Southeast Asia was hugely influenced by Indian culture and civilisation from around 200 BC until around the 15th century. Tamil traders, adventurers, teachers and priests continued to be the dominating influence in Southeast Asia until about 1500 CE. Tamil kings often ruled the earliest states in these regions. Hinduism and Buddhism both spread to these states from India and for many centuries co-existed there with mutual toleration. The policy was dynamic, forward looking and in complete empathy and solidarity with the hopes and aspirations of Southeast Asian people. India considered the struggle of Southeast countries against colonial rule as integral to its own struggle for freedom. No big or medium powers be allowed to dominate the area so as to fill the power vacuum created by withdrawal of European powers. Due to intensity of Cold War, relations between India, Malaysia and Singapore flourished, but the Indian foreign policy apparatus started losing interest in Southeast Asia. ASEAN came into existence when the war in Indo-china was escalating. The general pro-western orientation of the original five members of ASEAN compelled India to distance itself from ASEAN. India and ASEAN came together on the basis of mutuality of interests. The post-Cold War era indeed ushered in a new phase of rediscovery and renaissance in the relationship between India and ASEAN. Look East Policy (LEP) that was put in place by the then Prime Minister Narasimha Rao in 1992 under radically different geo-political and economic circumstances was primarily focused on strengthening ties between India and ASEAN countries. Having become a sectoral partner of ASEAN in 1992, India became a dialogue partner and member of the ASEAN Regional Forum (ARF) in 1996. India and ASEAN entered into a summit partnership in 2002, the tenth anniversary of LEP, and launched negotiations for a Free Trade Agreement (FTA) in goods in 2003. The NDA Government’s Act East Policy enunciated in Nov, 2014 sought not only to revive and reinvigorate India’s relations with ASEAN but expand its engagement beyond this region. The AEP envisages encompassing a much wider expanse spanning from the Koreas in the North to Australia and New Zealand in the South, from Bangladesh in India’s neighbourhood to Fiji and Pacific Island countries in the Far East. Issue of ownership, control, usage and exploitation of oil, gas, mineral and fisheries resources in the South China Sea has emerged as a major dispute between China and several ASEAN countries like Vietnam, Philippines, Brunei and Malaysia. India along with several others have supported freedom of navigation, ensuring maritime security, expeditious resolution of disputes according to provisions of UN Convention on the Law of the Seas 1982. A few ASEAN countries are still to ratify the FTA on Investment and Services between India and ASEAN. Negotiations on the Regional Comprehensive Economic Partnership (RCEP) Agreement which commenced in 2012 are due to be concluded soon. Entering into RCEP agreement will throw India open to uncontrolled imports of low quality, low priced Chinese goods which would be detrimental to its own industry. Secondly, India has not been able to receive any meaningful offers from other participants in the area of trade in services in which it enjoys a comparative advantage. India and ASEAN account for about 30% of the global population (i.e. 1.85 billion people) and a combined GDP of approximately USD 5.4 trillion. Together they would form the third largest economy in the world. The issuance of a Joint Strategic Vision for Asia Pacific and Indian Ocean Region has shown the USA’s pivot towards Asia. A meeting of the Quad (USA, Japan, Australia and India) at official level also gave strong indications of the interest of these countries to work together to ensure a free, open, inclusive and prosperous region. India needs to walk a tight-rope in its diplomacy towards both USA and China. Technology transfer, civilian nuclear cooperation, defence, innovation are all important sectors which need to be targeted. Use of soft power such as Buddhism, tourism, people to people contacts, and cultural ties with the region must also be harnessed. Wrt China, continuous engagement is necessary to expand cooperation, particularly on the economic front. Leverage the funds from AIIB, NDB. Improve Indian connectivity with ASEAN, particularly between North East India and Myanmar via the Trilateral Highway and Kaladan Multi-modal Trade Transit Project, BIMSTEC etc to promote peace and prosperity in the North-East region. Stronger partnership and enhanced cooperation should be prioritised by both sides if full potential of this engagement is to be realised. India and ASEAN are natural partners in their desire to create free, open and inclusive regional security architecture. India’s age old ties with South-East Asia have been established through culture, trade and religion and not through ”conquest and colonization.” India’s search for economic space resulted in the ‘Look East Policy’. The Look East Policy has today matured into a dynamic and action oriented ‘Act East Policy’. SAARC set up in 1985 lacks cohesiveness, despite geographical contiguity and historical and cultural links. The SAARC region remains the least integrated regions in the world and has failed to tackle their developmental deficit together. SAARC as an Organisation has not lived up to expectations when measured in terms of delivery. India’s foreign policy with respect to South Asian region is guided by the following principles. Panchsheel: These fundamental principles include for instance the five principles of peaceful co-existence: Mutual respect for each other’s territorial integrity and sovereignty, Mutual non-aggression, Mutual non-interference, Equality and mutual benefit, and Peaceful co-existence. Neighbourhood First: Cordial relations and productive cooperation with India’s neighbours, particularly with the founder Members of SAARC in South Asia, has always with a priority. Strategic Autonomy: Independence of decision making and strategic autonomy are significant features of India’s foreign policy. India thus believes in Partnerships and shuns Alliances, particularly military alliances. Constructive Engagement over Aggression: India advocates the policy of constructive engagement over aggression. It believes that violent retaliation and confrontation can only complicate the matters. No endorsement of Unilateral Sanctions: India also does not endorse the idea of imposing sanctions against any individual country by another country or group of countries unless these sanctions have been imposed by the United Nations as a result of international consensus. The importance of regional cooperation particularly in the spirit of South-South cooperation between geographically contiguous countries cannot be belittled. Seamless physical connectivity: Connectivity between regions increases the economic interaction and collective growth of region. This increases the economic and political bonhomie between nations and its people. Trade and Commerce: trade liberalisation under SAAFTA , operationalization of SAARC Agreement on Trade in Services (SATIS) have the potential to tackle the developmental deficit together. Common threats of Terrorism, Climate Change impacts, Poverty and Socio-Economic backwardness can be fought together as the problems plague all countries equally. Unexplored and high-potential areas like Power generation, Science & Technology, Sports, Culture can be strengthened through agreements and MoUs. The Bay of Bengal is fast becoming a key area of economic and strategic competition in the Indo-Pacific. 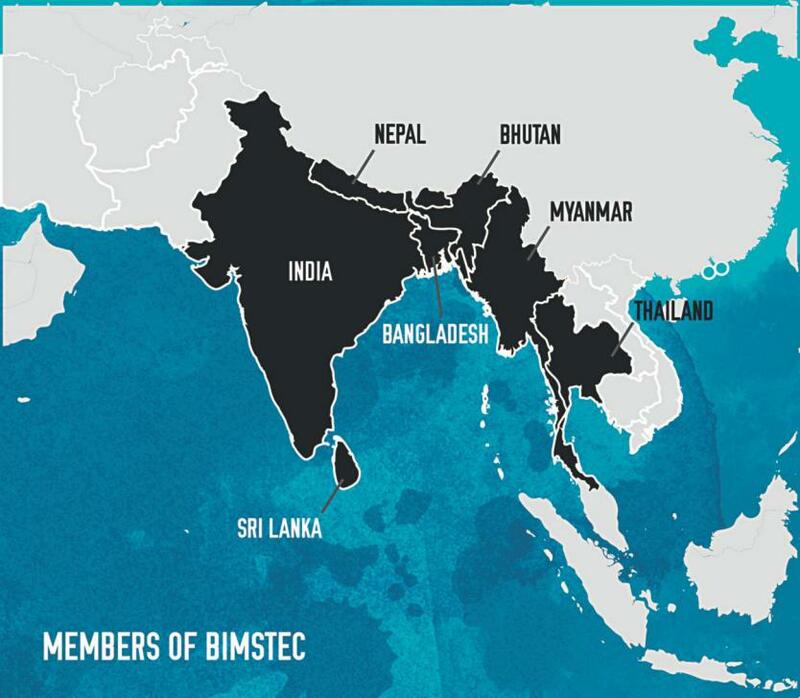 BIMSTEC is a bridge between South Asia and South East Asia. BIMSTEC has gained more favour as the preferred platform for regional cooperation in South Asia. The Sub-regional organization came into being in 1997, through the Bangkok declaration. The first summit was held in 2004 and its secretariat was set up in 2014 in Dhaka, Bangladesh. BIMSTEC has taken several initiatives and decisions to bolster cooperation and connectivity among the member states. Following the fourth meeting of the BIMSTEC in Kathmandu in August 2018, there is a renewed push to conclude a series of proposals to further cooperation and connectivity. Co-operation: India’s stimulating outlook towards Southeast Asia vis-à-vis Asia-Pacific as expressed through Act east policy and the other way round, i.e. the Asia-Pacific’s desire to have India as a strong stakeholder in the region. Connectivity, BIMSTEC has at last three major projects that, when finished, could transform the movement of goods and vehicles through the countries in the grouping. Regional cooperation in areas of mutual concerns including terrorism, violent extremism, transnational organised crime and insurgency; food security, energy; trade and investment, poverty alleviation to name a few. The BIMSTEC region has the largest share of social media users and largest user of mobile phones in the world. Poor literacy rates and digital literacy makes it vulnerable to cyber-crimes, data-theft, internet-frauds and propagation of fake news. In order to reap the digital dividend, there is a need of collaborative and co-operative effort to ensure rapid cyber capacity building. On the crucial issue of joint fight against terrorism, BIMSTEC already has a convention on combating international terrorism. All members have signed it, but yet to ratify. BIMSTEC is already looking at adopting the model of ASEAN Coordinating Centre for Humanitarian Assistance (AHA) on disaster management. BIMSTEC weather and climate centre at Noida will be renamed as BIMSTEC disaster management and climate change centre. India circulated a draft coastal security plan in December 2017 which has now been circulated to member states and their comments are awaited. India will provide training to member states at its disaster management training centre in Nagpur. India had sent a proposal on a joint parliamentarian’s forum and had asked for suggestions from the members. Many other potential areas like Maritime Connectivity, space cooperation, transnational crime and a human rights council can be looked into. Maldives is strategically located in the Indian Ocean. Maldives archipelago, comprising of 1,200 coral islands, lies next to key shipping lanes which ensure uninterrupted energy supplies to countries like India, China and Japan. Though small, the Maldives is India’s important neighbour and a valued partner in the Indian Ocean neighbourhood. India was among the first to recognise Maldives after its independence in 1965 and to establish diplomatic relations with the country. India established its mission at Malé in 1972. Operation Cactus in 1988: Indian Army’s operation foiled a coup in Maldives that was attempted by a pro-Eelam group. This was a success of India’s foreign policy without signalling any interference in the domestic affairs of a sovereign country. In 2006, Indian Navy gifted a Trinkat Class Fast Attack Craft of 46 m length to Maldives National Defence Force’s Coast Guard. India and Maldives have consistently supported each other in multilateral fora such as the UN, the Commonwealth, the NAM and the SAARC. India has offered assistance to Maldives wherever required. After the tsunami that struck Maldives on December 26, 2004, India was the first country to rush relief and aid to Maldives. The relations had soured after ex-president Yameen’s serious suppression of democracy with many opposition leaders being jailed under Arson and Sedition. The former pro-India Maldivian president Nasheed was also incarcerated. Yameen even proclaimed Emergency fearing Impeachment. India had assisted Maldives’ election process by sending its observers, and had also withdrawn observers at one point because the electoral process was neither free nor fair. India was the first to respond to the drinking water crisis in 2014 in the Island by sending a ship fitted with desalination plant and huge stock of potable water. The recent victory of Ibrahim Solih should come as a great relief and as a boost to India’s efforts to strengthen its partnerships in the neighbourhood. It marks not only the triumph of democratic forces in the Maldives, but also reflects the firm commitment to the values of democracy and the rule of law. India can now renew its ties with the new government and work with Maldives for ensuring stability and security of Indian Ocean region (IOR). NITI Aayog’s Strategy for New India @ 75 is a comprehensive national Strategy for New India, which defines clear objectives for 2022-23. It seeks to make development a Jan Andolan, details key recommendations across growth drivers, infrastructure, inclusion and governance. It is a detailed exposition across forty-one crucial areas, that recognizes the progress already made, identifies binding constraints, and suggests the way forward for achieving the clearly stated objectives. The document details out the overarching focus of the Strategy document. It focuses to further improve the policy environment in which private investors and other stakeholders can contribute their fullest towards achieving the goals set out for New India 2022. It gives the way to propel India towards a USD 5 trillion economy by 2030. It follows the UN Sustainable Development Goals, Inclusion, sustainability, participation, and gender equality. Major focus on renewable energy, organic farming (with the zero budget natural farming), increasing forest cover, and reducing pollution and waste. An entire chapter titled ‘Sustainable environment’ focuses on air pollution, solid waste management, water pollution, and forestry. The document focuses on air pollution, solid waste management, water pollution, and forestry where as there are much larger number of environmental issue India faces. Example: deforestation, global warming, land degradation, wiping out of bio-diversity, plastic pollution etc. The urgent need to conserve a range of non-forest ecosystems is missing. Example: grassland, marine and coastal, wetland, mountain, and desert conservation. The increasing presence of toxic chemicals around us finds no mention. Excessive use of fertilizers, herbicides, industrialization has lead to intoxication of soil, water sources and even biomagnification. The absence of an integrated, comprehensive view on how ecological issues can be integrated into all sectors indicates that this is still not core to the mindset of our planners. A case in support of the statement is study of 2008, the Confederation of Indian Industry indicated that India was already using twice of what its natural resources could sustain, and that more than half its biocapacity had already been eroded. c There is positive mention of organic farming models for replication, but nothing on the amazing work of dryland farmers (such as the Dalit women of the Deccan Development Society in Telangana) showing productive, sustainable, bio-diverse agriculture with millets and women as the fulcrum. NITI Aayog proposes a doubling of the extent of mining. The large-scale open-cast type mining is one of the biggest ecological and social disasters in India. NITI Aayog recommends doubling the number of domestic tourist visits to over 3,200 million from 1,614 million in 2016. Exceeding the carrying capacity has lead to degradation of many ecosystems. It proposes a host of mega river valley projects that have proved to be ecological nightmares, including Pancheshwar in the fragile Himalaya, the Ken-Betwa link in Madhya Pradesh, and dozens in the Northeast that are going to choke up rivers and are being pushed ahead despite strong local opposition. There is an emphasis on rapid, single-window clearance of infrastructure and other projects. Any decent ecological assessment of a project needs a year of study (over all seasons), so the 180 days limit it suggests will mean short-cuts. This rush also means compromising on crucial processes of social assessment, public hearings, and participatory decision-making, as already seen in the last few years. Planning will have to become more decentralised, but within a stipulated time framework. Bureaucracy will need to change from generalist to specialist, and its accountability will have to be based on outcomes achieved, not inputs or funds spent. By collecting fresh ideas and sharing them with the Central and State governments, it pushes frontiers and ensures that there is no inertia, which is quite natural in any organisation or institution. Making Environmental Impact Assessment more stringent. The debate of Environment and development is a tricky one. There is a need to balance both without compromising on either. Deliberations and discussions in public forum can bring out the shortcomings in the strategy. This can be restructured in tune with our efforts towards the Sustainable Development goals. Farm incomes have been squeezed by slower output growth, higher costs and increased vulnerability to a changing climate. Economists said that the GDP deflator for agriculture is negative for the first time in many years. And there are a slew of new problems resulting directly from government policies. The recent marches to New Delhi, Mumbai by thousands of farmers are any indication, the farm sector has already sent up emergency flares. The Telangana government has implemented this scheme to support farmers’ investment for two crops a year. The government is providing 83 million farmers Rs4,000 per acre per season to support farm investment twice a year, for the rabi and kharif seasons. The scheme is costing the state exchequer roughly Rs 12,000 crore per annum. It appears to have reached more than 90 per cent farmers, and yielded political dividends. Gulati et al have estimated that the cost of this scheme would be 97 trillion if the government implemented it at an all-India level, assuming a payout of Rs10,000 per hectare per year. The Odisha government has implemented this and involves payments to encourage cultivation and associated activities. the scheme is likely to cost about Rs 10,180 crore over three years. The various options like Minimum Support Price for about 25 crops, Farm Loan Waiver schemes undertaken by various state governments have failed to alleviate the problem. As per NSSO 2012-13, less than 10 per cent of the country’s farmers sold their produce at MSPs . Only about 6% of the farmers were aware of MSP. Farm Loan- waiver schemes doesn’t cover many small farmers aren’t eligible for bank credit. crowding out effect and loss in interest payments. It makes them ineligible for farm loan waiver as well as borrow at exorbitant interest rates from private sources. The Direct Cash/Investment scheme has however fared better and is a prudent scheme. This shift will be better for the country as it is more predictable and less market distorting. Unlike a loan waiver, in which banks appease a few farmers, KALIA’s main targets are rural activities as a whole. It will support farming on a small scale, sharecropping, fishing, animal herding, which are not covered under bank loans, but are caught in debt traps set up by local moneylenders. A farm loan waiver will reduce credit available to farmers in the long term, while income support can be used to make a repayment or at least activate a bank account which can then receive a loan. Fiscal Sustainability and Prudence: The huge costs involved may have an impact on Public investments in other infrastructure spending. The lack of clear revenue sources to fund such schemes is another limitation. State’s fiscal deficits: States like WB, Jharkand and even Central Government has started the implementation of direct income scheme. This can lead to increased burden on states which are already deviating from FRBM targets. Targeting Issues: Poor land record maintenance, exclusion of tenant farmers in some states, no women-farmer friendly provisions can lead to targeting issues. This can lead to status quo despite huge spending. 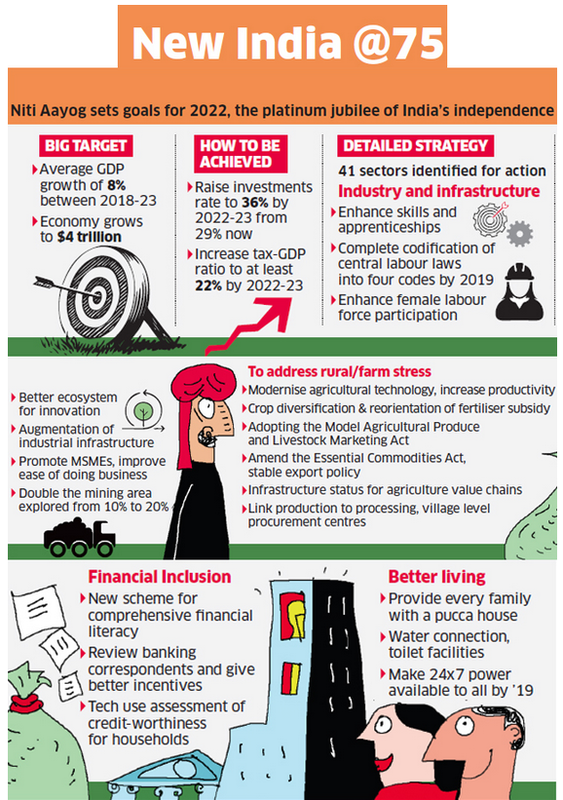 Not a panacea: Until India reforms its agri-marketing laws and frees agri-markets, it is time to atone through a structured and stable income policy for farmers for at least the next five years. Policy focus should be rather on investment — in efficient water management and irrigation, plant breeding and genetics, crop husbandry, market linkages and in breaking the middleman’s hold over the farm-to-consumer value chain, replacing it with farmer-led enterprises, whether cooperatives or producer companies, that allow farmers to capture a share of the value added to their produce along its journey to the factory or home. Long-term solution to farmer distress would be improving the supply chain, establishing agro-processing zones and creating a better agri-logistic platform. An income transfer scheme for poor farmers based on the Socio Economic and Caste Census (SECC) that has already mapped household deprivation may be a complementary and alternative scheme to MSP and Loan waiver.